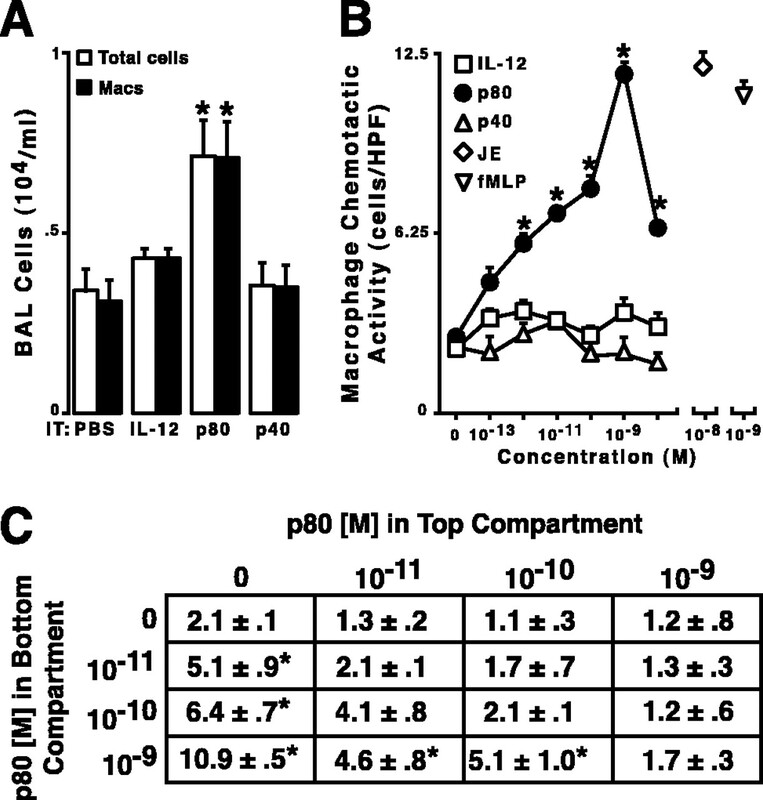 p80-dependent macrophage chemotaxis requires Rβ1 expression. A, C57BL/6J peritoneal macrophages were exposed to medium or medium plus p80 that was pretreated without or with rat IgG control or rat anti-mouse IL-12 p40 IgG and protein G beads (to deplete the Ab-p80 complex). B, C57BL/6J peritoneal macrophages were pretreated without or with goat IgG control or goat anti-human Rβ1 IgG and exposed to medium or p80 (10−9 M). C, Peritoneal macrophages were obtained from the indicated strain and exposed to medium, increasing concentrations of p80 (10−13–10−8 M), or JE (10−8 M). A–C, Chemotactic activity was determined as in Fig. 1 and a significant difference from p80 10−9 M (A and B) or from type BALB/cJ (C) by ANOVA is indicated (∗). Rβ1 is necessary and sufficient to mediate NIH3T3 cell p80-dependent chemotaxis and requires an intact cytoplasmic tail. A, NIH3T3 cells were uninfected (Control 3T3) or infected with retroviral supernatant containing empty vector (GFP), wild-type Rβ1 (Rβ1/GFP), or Rβ1 mutation lacking the cytoplasmic tail (ΔCyto/GFP). Cells were fixed with 2% paraformaldehyde, immunolabeled with mouse anti-mouse Rβ1 Ab, and detected with biotinylated goat anti-mouse IgG and streptavidin-conjugated Texas Red. Control mouse IgG, Texas Red only, and goat anti-mouse IgG plus Texas Red gave no signal above background (data not shown). Representative photomicrographs of merged images from identical fields with filters to detect Texas Red (red) and GFP (green) are shown (n = 3). Bar,10 μm. B, NIH3T3 cells treated as in A underwent FACS analysis for coexpression of cell surface Rβ1 (detected as above using a streptavidin-conjugated PE (SA-PE) reporter). Control mouse IgG, SA-PE only, and biotinylated goat anti-mouse IgG plus SA-PE gave no signal above background (data not shown). Representative dot blots with corresponding percentage of total cells are shown. C, NIH3T3 cells treated as in A were incubated in serum-free medium for 18 h and exposed to medium, p80 (10−9 M), or EGF (10−10 M) in a modified Boyden chamber for 6 h at 37°C. Chemotactic activity was determined as in Fig. 1 and a significant difference between control NIH3T3 cells exposed to medium (by ANOVA) is indicated (∗). HPF, High-power field. 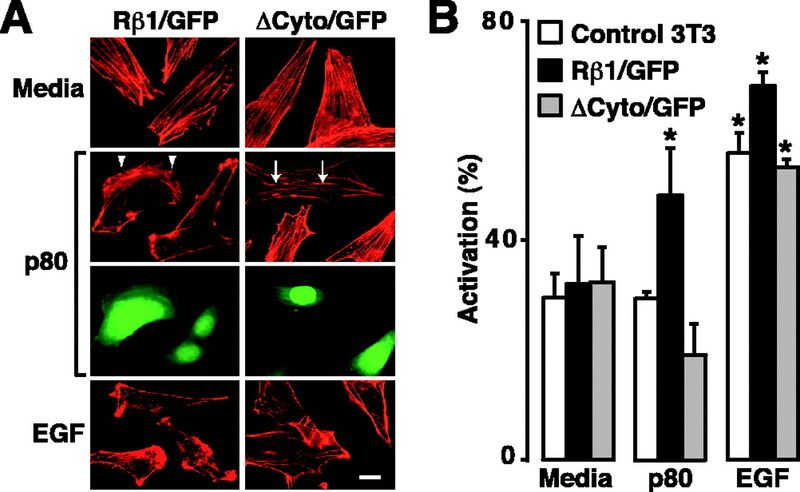 Rβ1 is necessary and sufficient to mediate macrophage p80-dependent chemotaxis and requires an intact cytoplasmic tail. 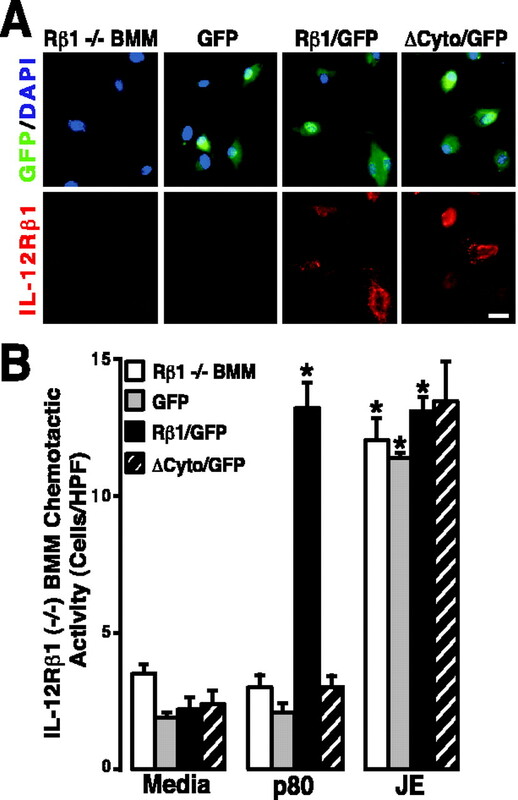 A, BALB/cJ Rβ1−/− bone marrow macrophages (Rβ1−/− BMM) were infected with retroviral supernatants containing empty vector (GFP), wild-type Rβ1 (Rβ1/GFP), or Rβ1 mutation lacking the cytoplasmic tail (ΔCyto/GFP). Cells were incubated with rat anti-mouse CD16/CD32 FC block and Rβ1 expression was determined as in Fig. 3A. Mouse IgG, Texas Red only, and goat anti-mouse IgG plus Texas Red gave no signal above background (data not shown). Representative photomicrographs of merged images from identical fields with filters to detect GFP (green) and DNA (stained with 4′,6′-diamidino-2-phenylindole, blue) on the top row and Rβ1 expression (red) on the bottom row are shown (n = 3). Bar, 20 μm. B, Rβ1−/− BMM cells treated as in A and exposed to medium, p80 (10−9 M), or JE (10−8 M) in a modified Boyden chamber for 2 h at 37°C. Chemotactic activity was determined as in Fig. 1 and a significant difference between Rβ1−/− BMM cells exposed to medium (by ANOVA) is indicated (∗).